Should you set up a dedicated email address? I recommend setting up a dedicated matched betting email address to use when signing up to bookmakers and exchanges. Alternatively, setting up a filter in your email provider so that all emails from bookmaker email addresses go to a particular folder. Here are the instructions on Gmail, Hotmail and Yahoo. This helps to keep all the bookmaker offers you receive in one inbox (or one folder) and reduces the chance of missing an offer because it gets clogged up in your personal email address. It is well worth checking every 1-2 days your dedicated matched betting email address (or folder) to see if you have any exclusive email offers. If you have already joined bookmakers using your personal email address, then you can easily change your registered email address in your bookmaker account settings. Exclusive Bookmaker Email Offers - How Often Will You Receive Them? They are relatively rare to receive, usually I'd estimate I receive 1 each week, but they are usually good value. The majority will be worth an easy few pounds, for example 'Bet £5 Get £5', I receive these from SkyBet around once a month. The best offers I have received has been a £100 Bet365 bonus, worth over £70 profit risk free. Bwin can be good too with their 'Deposit £50 Get £25' which is worth an easy £17 profit risk free, as shown below. Note I will always place a couple of mug bets if I receive a personal offer, as the reason they're sending you the offer is to encourage you to keep betting with them. 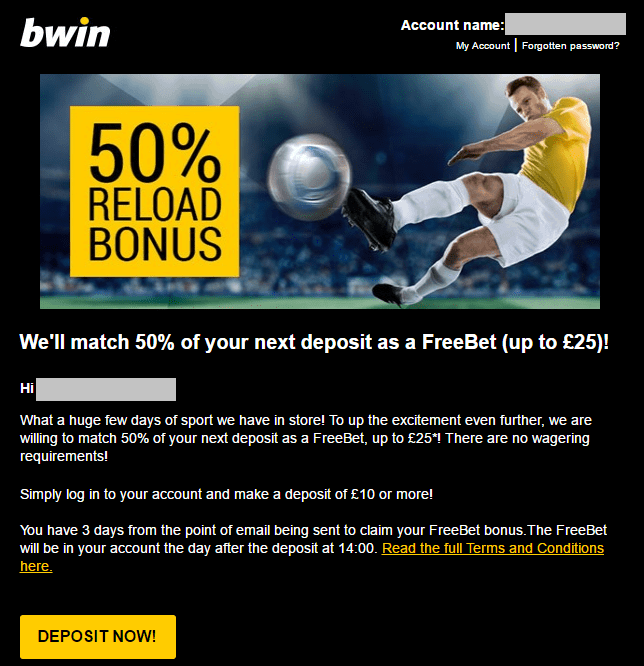 Bwin have sent me an email with a very straightforward Daily / Reload Offer 'Deposit £50 Get £25' offer, worth around £17 profit risk free. I think it will be because I haven't logged into my account or placed a bet for a certain period or time. Bwin don't have regular Reload Offers so I don't really use them much. If you receive this offer too either now or in the future, simply deposit £50 to receive the £25 free bet (credited by 14:00 the following day). Once credited, I will place 2 x £25 mug bets with my £50 cash balance to keep Bwin happy and then use the £25 free bet on a high odds match.